Pieter Willem Groen was born in Katwijk aan Zee, Holland on 14th April 1808 to parents Willem Groen and Jaapje Schaap. He arrived at Tristan aboard the American schooner Emily of Stonnington sailing from New York. She called at Tristan in October 1836 having left 6 of her men on Gough Island with a boat and provisions for six months to capture seals. She anchored near the south east shore but was unfortunately too close and dragged her anchors in a sudden violent storm and was rapidly beaten to pieces on the rocks. Fortunately no lives were lost and the crew made their way round the coast to the settlement, where they were kindly received by William Glass and the community. The Emily's Captain Ash made his way to St Helena and persuaded the US Consul to charter a British rescue ship, the Louisa, but when it eventually arrived at Gough and Tristan, most of the crew had already been picked up by the American ship Bingham. However three men decided to settle on the island: They were William Daley, an American, Peter Miller (Møller), a Dane and Peter William Green (Pieter Willem Groen), a Dutch native of Katwijk aan Zee, near Amsterdam. In December he married Mary Jacobs (one of the daughters Sarah Jacobs bought with her from St Helena Island in 1827) although the marriage was not made official until 19th January 1852. "Legal" marriages performed by a clergyman weren't possible prior to the arrival of the island's first resident clergyman, Reverend William F. Taylor and so, were performed by the headman, William Glass. Together Peter and Mary had 4 sons and 4 daughters. When William Glass died on 24th November 1853 he was replaced as headman by Alexander Cotton, with the assistance of Peter Green, until 1857 when Peter Green became the Headman of the island. 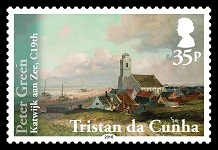 During his lifetime the islanders saved the lives of hundreds of shipwrecked sailors. Peter Green was thanked by the British and American Governments and received a personal acknowledgment from the King of Italy. 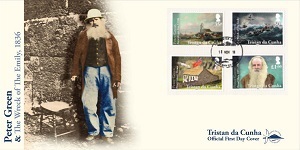 In 1867 he welcomed HRH Prince Alfred, Duke of Edinburgh to the island and it was Peter Green who asked if the settlement could be named after him. In 1879 he was awarded, on behalf of the community, a gold hunting-cased pocket watch and chain by the President of the United States for assistance in rescuing the passengers and crew of the Mabel Clark the previous year. In 1880 the Shipwrecked Mariner's Society awarded him a medal for gallantry for the same rescue. 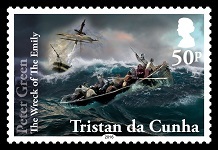 Then in 1885 the Tristan lifeboat disaster occurred, an event that would make Tristan an "island of widows". This was a tragedy for both the whole island community and for Peter Green personally (he lost 3 sons, 3 grandsons, 3 brothers-in-law and 1 son-in-law). It is believed that the preservation of the settlement at this crisis was due to the influence of Peter Green, as he was greatly opposed to any idea of migration. A medallion was presented to him, by the King of Italy, in 1893 after the islanders rescued and looked after the crew of the ship Italia which was wrecked in 1892. As a settler on Tristan he was proud to be a subject of the Queen of England and in 1896 HMS Magpie bought his prized procession, a signed portrait of Queen Victoria that she had sent him, to the island. This now hangs in St Mary's Church. However he never forgot that he was a Dutchman and his native village of Katwijk aan Zee occupied a warm corner of his heart. On the 2nd April, 1902 Peter Green departed this life within twelve days of reaching the age of ninety-four. On the following day he was buried with solemn ceremony in the little graveyard near the sea. All the inhabitants attended the funeral. The burial service was read by his granddaughter, Mrs. Frances Repetto. 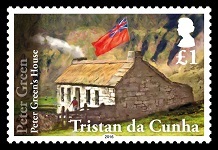 No memorial stone shows the grave of the great old man whose life for nearly seventy years was so closely connected with Tristan da Cunha, in good and in evil days. It may be supposed that he himself did not wish otherwise, if we recall his own words spoken at the visit of the Duke of Edinburgh "I am in no respect superior to the others; on Tristan we are all equal." No one had the courage to enter in the registers the death of their father, grandfather, and headman. 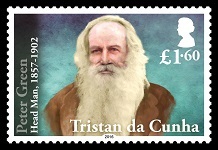 J.Brander, Tristan da Cunha 1502-1902.